Located in the North Tower of the Avalon Hotel in Miami Beach, the seafood grille A Fish Called Avalon Restaurant, boasts a winning atmosphere and fresh menu that proudly touts new wonderfully textured and flavorful items as well as beloved, delicious traditional menu choices. Chef Kal Abdalla has recently joined the team at A Fish Called Avalon, bringing with him his full-plate philosophy that offers plenty of good, satisfying food. The Chef has successfully run kitchens at the Forge and Prezza Restaurant and Martini Bar in recent years. Some of the newer menu items that Chef Abdalla has brought to the table at A Fish Called Avalon are entrees such as baby back ribs in a watermelon barbecue glaze with pineapple coleslaw and sweet potato gaufrettes(very thin and crispy wafers ) and crab bisque with sage crème fraiche, just to name a couple of headline entrees. From splendid traditional seafood fare such as pan-roasted crab cakes and grilled mahi mahi to prime,dry aged steaks cooked to your specifications with delightful sauces such as green peppercorn cognac or pecka peppa three mustard horseradish sauce, the menu options are sure to have something pleasing to all. A Fish Called Avalon also has a kids menu offering the ever-favorite chicken tenders and fries or a linguine served with either butter or tomato sauce to suit almost any picky kid that might pull up a chair. The star of the dessert menu is the infamous Key Lime Pie. 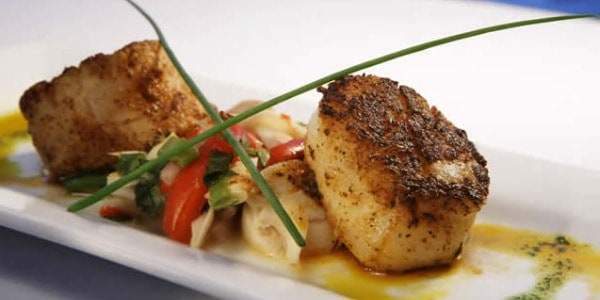 A Fish Called Avalon is a seafood grille sporting a great atmosphere for dining with friends and family. With street side or patio seating outdoors, diners can people watch and enjoy the fresh ocean breeze accompanied by live music every evening. A more intimate setting can be found for casually elegant dining inside the restaurant. For a fun Miami twist, on Sunday evenings from 6 to 8 original episodes of Miami Vice are shown at the bar. A vibrant, popular seafood grille in Miami’s South Beach, A Fish Called Avalon offers sumptuous cuisine in an attractive beach side atmosphere that appeals well to travelers and locals alike.